In the Genroki period (1688-1704) of the Edo Era (1688-1867), men would visit bath houses. Bath women, or yuna, would wash, comb, set men’s hair, and offer sexual favors. Because it took two hands to style a man’s top knot, yuna put their utilitarian combs casually in their hair. 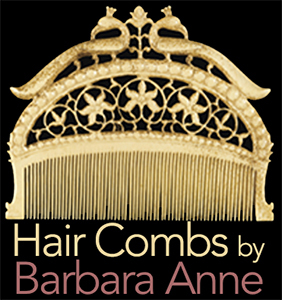 The trend caught the attention of married and unmarried women from all social classes, and combs changed from a tool to an ornament. Makers used ivory, buffalo horn, lacquered wood, coral, and tortoiseshell, which was by far the most expensive material. Seamen painted combs, too. They chose glass because grime could be wiped off, and glass preserved the pigments against salt air, which would ruin other materials. 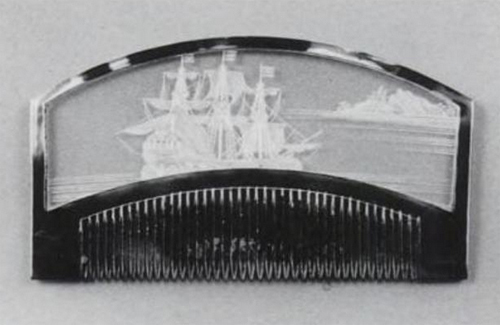 This comb is in the Kobe City Museum in Japan: a tall ship is painted on glass and encased in tortoiseshell. The museum gives a date of c. 1800. This date reflects the foreign policy of Tokugawa Iemitsu (1604-1651). The Sakoku Edict of 1635 remained in place until 1854. Sakoku means locked country. No foreigner could enter. No Japanese citizen could leave. It was a reaction to Catholic missionaries having converted 500,000 Japanese people to Christianity by 1600, including some feudal lords. The Shogunate did not trust European intentions and threw them out — with one exception: The Dutch. 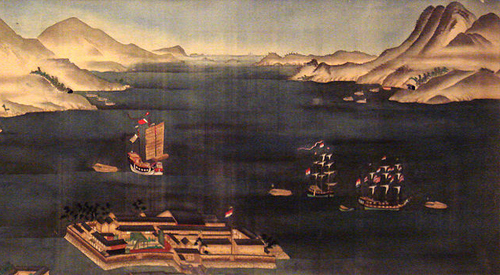 An artificial island was made in the Bay of Nagasaki called Dejima. Only Dutch ships were allowed. The Dutch could not cross into Nagasaki, and only Japanese who performed necessary tasks, such as carpenters, cooks, and women of pleasure were allowed in. 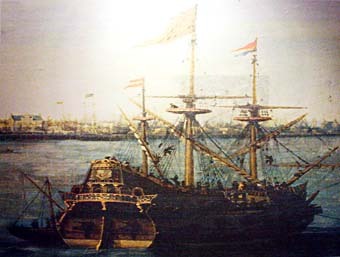 In 1790, only one Dutch ship was allowed to come. I am going to make a guess. This comb was painted by a Japanese ship-carpenter in 1790, documenting the arrival of the only Dutch merchant ship to arrive that year. 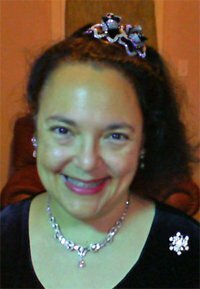 He would have made it for one of the women of pleasure, who entertained the Dutch in Dejima. Thank you, Joost! I read about the Dutch. They were the only ones who were allowed to trade with Japan. I think you’re right. I’ll change the article. THANK YOU!!!!!!!!!!!!!!!!!!!!! The article has been changed!